69 Ways to Kill a Zombie is a room-scale first-person zombie wave-based shooter for the HTC Vive. 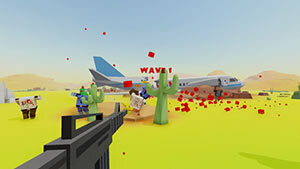 You can take use of more than 60 different weapons and tools to unleash destruction upon the zombie horde. You can also pick up random power-ups to help you survive longer in the battlefield. There are currently three maps available but more coming soon. The game is available in Early Access via Steam. 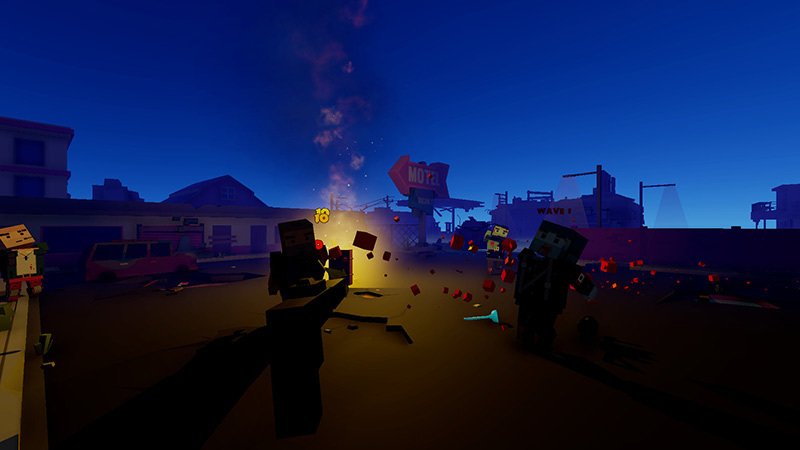 69 Ways to Kill a Zombie is a first-person virtual reality wave shooter. There are many zombies shooters out there, but this adds some unique twists to the gameplay mechanics which make it stand out from the rest. First of all, the game features a unique locomotion movement which is so much fun and very intuitive. Instead of teleporting yourself to a designated location, you need to move your hand like you are walking or running, and the character will move across where you are looking at. I really like that because the continuous body movement gets you into the game and get your heart pumping. All you need to do is to hold down the grip pad buttons on the controller and swing your arms like you are walking. Just keep in mind that this might cause motion sickness to some. I've read some users' opinion and some have mentioned that this locomotion movement made them feel bad. The second unique aspect of this game is that is completely physics-based, both the movement and the interaction with the environment. Shooting zombies and watching them blown up to pieces is really fun. It's really cool to see their heads ripping off their body when you shoot it. Of course, this is nothing that will happen in real-life, it's an arcade shooter, but in my opinion, it just feels more satisfying to kill enemies like. Some gamers might prefer the more realistic approach, I just enjoy feeling very powerful, and I feel that mainly in these type of arcade games. 59 Ways to Kill a Zombie features more than 60 different weapons and lots of explosives, traps, and tools which are spread across the environment, but most weapons feel more or less the same. It would be nice to see some more variety in terms of damage and handling. I also think that the developer can elevate the difficulty and over difficulty levels and a progression system that will motivate you to come back and play more. There are also some crashes and bugs, but I'm sure that the developer has taken this feedback from the Steam users and will fix them soon enough. One other thing that I think that can be improved is the zombie's movement. They just move slow and straight towards you. They have no surprise moves and you can easily run away from them because you just move faster than they do. Each type of zombie should have its own unique set of moves and attack attributes, so when things start to get rough, you can apply strategy on which one to target first. Now a bit about the graphics. 69 Ways to Kill a Zombie has really lovely detailed pixel-art visuals. Things take more of geometric shapes than fully-detailed 3D mesh objects. The thing is that it doesn't take from its beauty because the environment is very vivid, the lighting effects are really well made, especially at night where it is used to produce a more atmospheric and dramatic looking environment. So although the game doesn't take a realistic approach to visuals, the game still looks great, plays and feels great. If the issues that players encounter are solved and those things that I've mentioned are improved, it can become a great shooter. I personally would love to see the developer adding a dynamic increasing difficulty features and allow us to play cooperatively with a friend, that would be so awesome, like in Call of Duty Zombie mode. Overall, I love the unique movement mechanics and I think that it's overall a good VR shooter, but it has a potential to become so much better.